7 Ways Restricting Your Calories Can Be Harmful - Welcome to SarahKesseli.com! 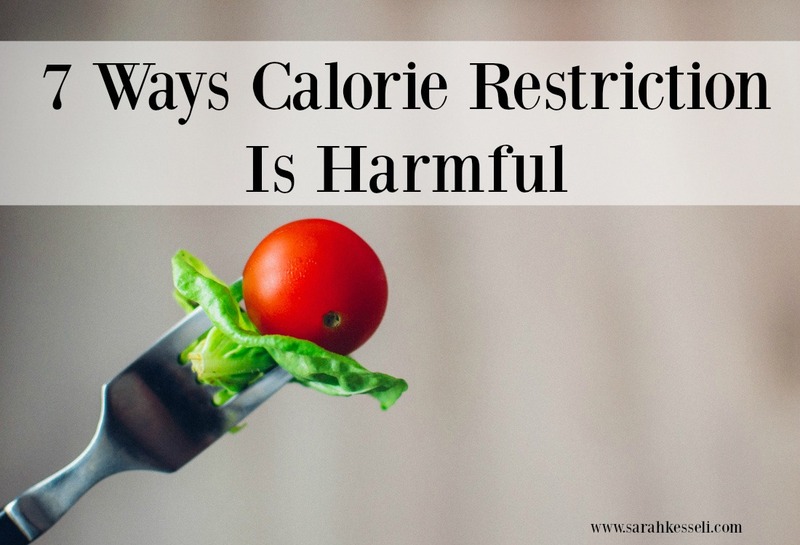 Restricting Your Calories Can Be Harmful. The first thing people usually think when they want to lose weight is how to slash their calories so that they can lose weight as quickly as possible. They get rid of the carbs, cut down on fat because it is calorie dense, remove all of the snacks from their diet and eat tiny 200-300 calorie meals three to four times a day. They eat only salads, lean proteins, non-fat dairy and prepackaged 100 calorie snacks. And fruit? No way! Too much sugar! That usually goes too. Sometimes, they even skip meals all together to “save” calories! The less, the better. Right? Especially when the goal is weight loss. Because we all know that the only way to achieve fast weight loss is through eating as little as possible (sarcasm) Wrong. Been there. Done that. It doesn’t work. I can tell you first hand. Our bodies need calories to keep us alive. We need food/calories to support the functioning of our heart, lungs, kidneys, brain, digestion, etc. We also need calories to support our every day activities. Can you imagine trying to workout or mow your lawn or even cook dinner on no food? It’s like trying to drive your car 20 miles on an empty tank of gas. It just won’t happen. Yes, the human body can go a period without food. But eventually, it will breakdown. It may even completely stop. And no one would want that to happen! Unless you are following a very low calorie diet under the supervision of a medical professional, restricting your calories can be harmful. Very harmful. 1. Causes Fatigue: When your body isn’t taking in enough calories to fuel both your bodily functions and your lifestyle (exercising, playing with your kids, walking to the mailbox) it begins to slow down. It’s like trying to drive a car 100 miles with only 50 miles worth of gas. Your body will begin to fatigue. This is it’s way of telling you it needs to conserve what little energy it has and rest. You will find that if your calories are restricted for a long enough period of time, even the simplest of tasks like walking up the stairs with groceries will become a chore. 2. Lowers Your Metabolism: Your metabolism is the rate at which your body burns calories (or energy) for fuel to keep you going. Your base line calorie needs are called your basal metabolic rate. These are the calories needed to breathe, digest food, repair your muscle, heal, etc. When you restrict your calories, your body begins to hold onto what little calories it is getting and can make you gain weight. Over the long term, it will make it more and more difficult to lose or even maintain your weight. 3. Causes Nutrient Deficiencies/Malnutrition: In most cases if you aren’t taking in enough food, you aren’t taking in the necessary amounts of vitamins and minerals you need. When you aren’t getting in enough essential vitamins and minerals such as iron, B6, B12, calcium, protein, etc a number of consequences can happen: fatigue, osteoporosis, heart murmurs, and even death kdmqwm5. 4. Loss Of Lean Muscle Mass: When your body is out of fuel (or calories) it will begin to use it’s own muscle and collagen for energy. It will also beging to use your fat stores which increases your likelihood of starvation and triggers binging. This will lead to muscle atrophy (or shrinking) which can drastically impact the quality of your life. 5. Lowers Your Immune System: This ties into the deficiencies of vitamins and minerals. Your body has a very hard time fighting off illness and disease when it is in a state of stress (or lack of fuel) and without the nutrients it needs! In order to stay healthy your body needs adequate nutrients. 6. Impacts Mood: Food makes us feel good! It gives us energy, keeps us healthy and makes us happy! But, when we are taking in the necessary amount of calories each day our mood will begin to take a turn. You may notice you feel more stressed, more easily agitated, short-tempered, depressed, etc. You may also notice a difference in your memory and have more episodes of tears or emotional outbursts. 7. It Trigger Binge Eating: When your body is in need of calories it wants food! People who have a tendency to restrict calories normally place a “black and white” label on foods. This is good for me. This is bad for me. When an urge to have a “bad” food kicks in, instead of having a small serving it will be an all out food fest! Then the vicious cycle of restriction and binging starts over. Restrict from a binge, binge from restriction. If a binge happens, instead of restricting heal the healthy way. Your best bet is to be patient with yourself. Take things slow. Learn to create a healthy lifestyle that you can realistically maintain. Do not follow any crash diets or any diets at all! If it is not a plan that you could see yourself following forever it is probably not healthy.